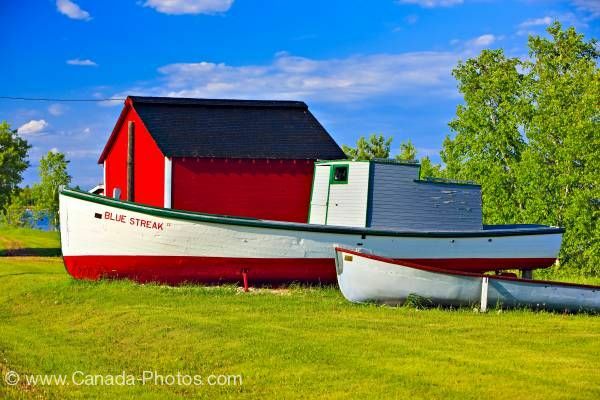 A brightly painted red shed stands behind a couple of old boats and are on display in Hecla Village located along the shores of Lake Winnipeg in Manitoba, Canada. While wandering the self-guided trails in Hecla Village which borders Lake Winnipeg on Hecla Island in Manitoba, Canada, visitors can take a step back into the history of the island. Over the years, a shed has been repainted in red and the old fishing boats have had a new coat of paint to keep them in their original condition. The shed and old boats are just a small sample of the island's past and visitors can start the walk around the village at the Ice House. As the trail continues, one can view the memorial plaques, the sawmill and ice plow until reaching the fishing boats. Continuing on to the tools and machines exhibit, the church and cemetery, a log house, the general store, the museum, the interpretative centre, the school and the community hall, until finally ending up back at the ice house. Picture of a repainted red shed and old boats along the trail in Hecla Village on the shores of Lake Winnipeg in Manitoba. The island covers an area of approximately 1,084 square kilometers and is surrounded by Lake Winnipeg which is one of the largest freshwater lakes not just in Manitoba, but around the world. About 2 hours north of Winnipeg, Manitoba, Hecla Island provides visitors with numerous tourist attractions, one being the historic village with others like a campground, resort hotels, sandy beaches, a marina and a pristine 18 hole golf course.